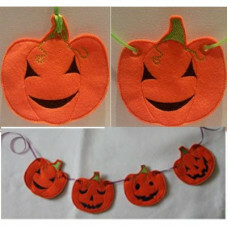 These little cars can be made as individual hanging ornaments, or can be used to embellish your 5 x.. 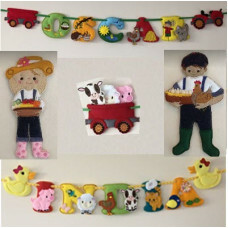 These little designs can be used to embellish the stuffed letters banners and garlands (purchased s..
Set of 6 designs: 4 little dinos, Volcano and Palm tree - can be strung to hang as a garland -.. 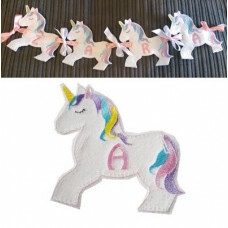 These little designs can be used to embellish the stuffed letters banners and garlands, or they can .. 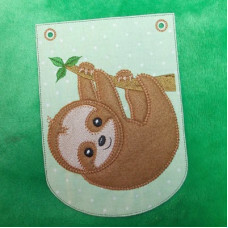 This is a bumper set of hangers and add on designs to embellish your large letters or wreath ring (..
Buy both sizes (4x4 and 5x7) and save 33%!In this set you will receive 24 number pockets and 1 blank.. 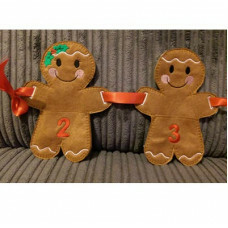 Numbers 0-9 and apostrophe, hyphen and ampersand Gingerbread men sporting an applique number or sym..
Pumpkin Banner – can also be made as separate hangers Something for Halloween – Can be fla.. 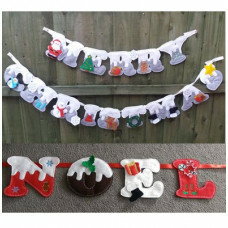 This design set includes both running stitch edge and blanket stitch edge bunting flags with the sl..
Make your own name banners with these chubby letters - each letter is 5 x 7 and comes in two variat..
0 - 9 Stuffed Numbers and Hypen and &Balloons, Candle and CupcakeUse these on their own or in co..
26 letters and 10 numbers included in this set – each unicorn is 5inches wide when completed ..